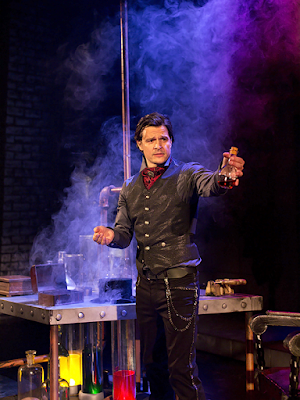 I've already reviewed the new Finnish production of Jekyll & Hyde, but having now seen the production's alternate lead Joni Leponiemi and also another performance featuring Henri Halkola, I thought to write a short addendum to my critique. I saw Joni Leponiemi as Dr. Jekyll and Mr. Hyde last weekend, and let me tell you – that was one of the most enjoyable performances of said roles I've ever seen! His take of the characters is very energetic and slightly over-the-top, especially as Hyde. I mean that in a good way: it's mostly a fun sort of over-the-topness, a style that suits this over-the-top musical. I was especially impressed by Leponiemi's This Is the Moment. Usually, I lump the song in with every other overblown, overdone, overappreciated musical showstopper – Music of the Night, Bring Him Home, Don't Cry for Me, Argentina... A song where the plot comes to a halt so the lead can show off their vocals. But this time, This Is the Moment made me feel excited for the character and actually helped me to understand why Jekyll makes his disastrous decision. It's surprising how seldom that happens! I also saw another performance with alternate lead Henri Halkola a while ago. His Jekyll is subtler and calmer than Leponiemi's, and though his performance is still not quite to my personal tastes, I enjoyed him better the second time around. In my initial review, I mentioned not liking the second act very much. The second half of the show still drags, but I think it's mostly due to the script. In His Eyes and Dangerous Game are some of my least favourite Frank Wildhorn songs, and to hear them back to back... I can't help zoning out. But it's gotten better. Halkola's Confrontation has become a lot easier to follow and more enjoyable, and Leponiemi's take of the song is powerful and impressive. The wedding scene, while still a bit too melodramatic even for a silly show such as this, is also more interesting to watch each time. At first, I thought Jyväskylän kaupunginteatteri's Jekyll & Hyde was nothing special, only a good production of a flawed musical. Now, I am starting to reconsider. I'm falling in love with the production more and more each time I see it. I cannot wait to go back.